Karela (bitter gourd) was one of those vegetables I hated back then. But it was a regularly cooked dish in our home. When moved out of home, I realized there are not even many other vegetables available like they were back in India, leave alone karela. But when I set my eyes upon this vegetable, little did I realize I have been missing to eat karela. So I decided to buy and prepare it myself for the first time.. and wow, it came out so nice I didn't believe it.. it's after all not that bad.. !! It is an exotic dish in here because once in a few months we see karela on the shelves.. only on our lucky times I guess.. Preparing karela is really simple and easy, and requires the minimum time. I did it the way my mother does. She does not soak it in salt to remove the bitterness, and neither did I.. but if you get very bitter karelas, or do not like the bitterness; do sprinkle salt on the cut karelas and keep for about 10-15 minutes. Wash and proceed with making as in this recipe. Heat oil on medium flame and add the sliced onions. Fry until they are transparent. Add the karela, and add salt, red chilli powder and turmeric powder. 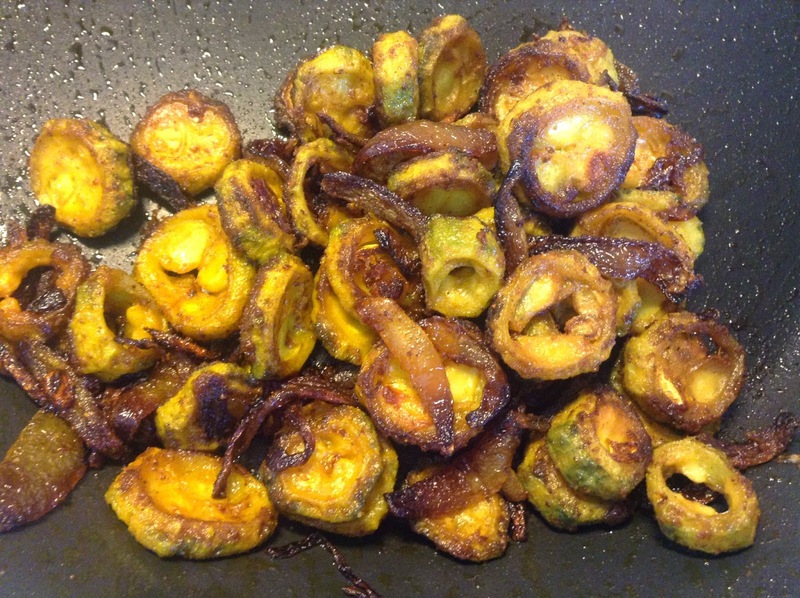 Fry on open flame until the karela becomes soft and the onions are etting brown. Add the mango powder and sprinkle garam masala. Mix well and serve.